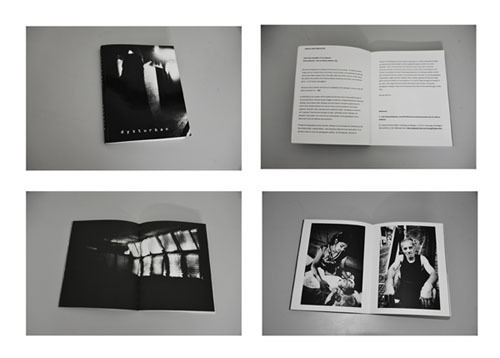 DYSTURBAN: a 110-page photobook by Konmark with an introduction ("Urban Disturbances") by Spyridon Kaprinis. A 29-page online preview is available. As individuals we are unaware of this shadow but Konmark seems to be acutely aware of our visceral dimness. Homeless people, beggars, prostitutes, marginalized persons, deserted buildings, shop windows, dolls, alleyways and train stations all acquire a grainy hue of a dream, which oscillates between the extreme states of sensual pleasure and mental nightmare. Konmark's urban cityscapes have a powerful impact, reminding us of derelict and “unpopular” sites that exist amongst our daily, “politically correct” lifestyles. His dystopian “urbanscapes” are a kind of cross-breed between a post-apocalyptic, future fallout and a numb and debased cultural present.